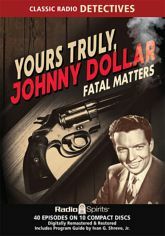 Insurance investigator Johnny Dollar was a man of contradictions. He was tough and compassionate, sardonic and thoughtful. You never knew quite what he might do to solve a case -- but you always knew he'd get it done! Bob Bailey stars as Johnny for five fascinating five-part serial adventures, and a collection of harrowing half-hour tales! Prepare the expense report! Includes a Program Guide. 40 digitally remastered episodes on 10 audio CDs. 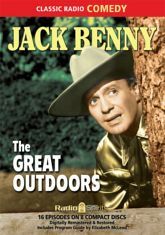 Rough, rugged, and ready for anything, Jack Benny braves the howling winds atop an icy mountain peak…until he falls down and drags himself back to the ski lodge. Get ready for the comic adventures of radio's favorite comedian as you've never heard him before. He's the manliest of men, the conqueror of every wilderness, the very personification of virile vigor! Includes a Program Guide. 16 digitally remastered episodes on 8 audio CDs. 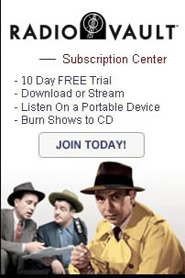 Click here, to make a show suggestion or comment. Follow LAPD Sgt. Joe Friday and his partners, Sgts. Ben Romero and Frank Smith, in twenty real-life cases from both the early weeks of the program's run and its later years! (You'll even hear the voice of Harry Morgan, who went on to become Webb's partner on the television version of Dragnet. Includes a Program Guide. A dive bar before dive bars were cool -- that's Duffy's Tavern. Radio's favorite Third Avenue watering hole was full of zany New York characters and A-List guest stars, all presided over by your genial master of malaproprial management, Archie himself (played to perfection by Ed Gardner)! Join the Tavern regulars Eddie the Waiter, Clifton Finnegan, and Miss Duffy -- plus VIP vistors like Bing Crosby, Dennis Day, and Artie Shaw -- for sixteen laugh-packed episodes! Includes a Program Guide. By the 1956-57 season, Gunsmoke had reached the peak of its dramatic power as radio's foremost adult western, with its powerful scripts and careful characterizations. William Conrad leads the cast as Marshal Matt Dillon, along with Parley Baer as Chester, Howard McNear as Doc, and Georgia Ellis as Kitty. Experience 27 hard-hitting adventures from this landmark season in this 10 disc collection! Includes a Program Guide. Catch the buzz -- before the buzz catches you! Britt Reid, daring young publisher, masks up against organized crime and urban corruption as The Green Hornet! Join our hero and his stalwart valet Kato for another collection of twenty classic adventures from the 1948-49 seasons, including several previously uncirculated episodes not heard since their original broadcast. Includes a Program Guide. Connie Brooks (Eve Arden) rewrote the textbook on how popular culture looked at teachers -- with a fresh, funny, and always human take on the pedagogic profession. Come and study these twenty terrific episodes from 1954 - 1956. If you travel with her through the halls, you might encounter adolescent blunderer Walter Denton (Richard Crenna), the principal's bobby-soxer daughter Harriet (Gloria McMillan), or the fumbling frog-obsessed science teacher Philip Boynton (Robert Rockwell). Principal Osgood Conklin (Gale Gordon) was her outstanding comic foil. Includes a Program Guide. He's a smart tough guy…or a tough smart guy. Either way, he's Pacific Northwestern private eye Harry Nile. From the imagination of Seattle-based writer-producer Jim French come twenty-four tense, exciting radio thrillers produced in the classic style by modern talent. Phil Harper is back as Nile, with Pat French as Murphy, in these hard-boiled cases for hard luck customers. Get set for radio excitement the way you like it best -- with The Adventures of Harry Nile! Get shows from this series. Get the latest news on new products and special deals and our monthly broadcast schedule... Sign up for our email alert! Click here to request a Free Radio Spirits Catalog!